TOBA’s programs support our mission to improve the economics, integrity and pleasure of the sport on behalf of owners and breeders. Through our commitment to recruiting new owners to the industry, providing education through our clinics and seminars and enhancing owner and breeder experiences through programs such as the TOBA Owners Concierge and Sales Integrity Program. TOBA is the advocate for Thoroughbred owners and breeders. TOBA offers educational, non-commercial seminars and clinics for prospective, new and established owners. TOBA’s goal is to provide industry participants with the knowledge necessary to improve the likelihood for success in the Thoroughbred business. This seminar provides a basic introduction to Thoroughbred ownership. Topics include how to build a racing stable, owner and trainer communications, common veterinary concerns, accounting and insurance issues, understanding racing partnerships and much more. All seminars and clinics are sponsored by The Horse. Our programs are held at various locations each year throughout North America. Bruce Maller, Incline Village Nev.
Christopher A. Sterbenz, Vienna Va. The Thoroughbred Owners and Breeders Association’s Owners Concierge is dedicated to the encouragement of excellence and growth in the horse racing industry by providing owners with exceptional customer service, timely information and access to local resources. The goal is to ensure an exciting and successful off-track as well as on-track experience by serving the diverse needs of Thoroughbred owners. In this day and age with time being limited, the TOBA Owners Concierge is geared toward offering peace of mind by providing clear and concise information, presented in an organized and easily accessible format. The concierge service is an owner-based initiative that, both directly and indirectly, caters to the Thoroughbred owners’ needs, as well as serving as a liaison between the horse owner and the racetrack in addition to facilitating relations with the extended racing community. Thoroughbred OwnerView is a free information website developed jointly by The Jockey Club and Thoroughbred Owners and Breeders Association for new, prospective and current Thoroughbred owners. OwnerView includes a wealth of information about Trainers, Racing Syndicates, Getting Started, Licensing, Racetracks, Veterinary, Aftercare, Publications and State Incentive programs. Read below for a brief description of what you will find on OwnerView. At the behest of the Thoroughbred Owners and Breeders Association, the Sales Integrity Program Task Force was developed in response to an expressed desire within the Thoroughbred Industry to improve the opportunity for buyers at public auction sales to feel informed, understand the various aspects of the process and be confident they were being fairly treated. The project was specifically geared toward the needs of new investors, but not designed exclusively for them. At the same time, it is recognized that the interests of consignors, breeders, agents, veterinarians, trainers, sale companies and horses need also to be protected and that the Thoroughbred auction scene inherently involves risks for all concerned. The 22-person committee spent many hours, over several months, developing a Code of Ethics for public auction. The Code of Ethics incorporates issues of disclosure of ownership, dual agency (the practice of an agent accepting a commission from the buyer for purchasing/bidding on the horse on the buyer’s behalf and also accepting any commission or other commercial benefit from any party involved with the selling/consigning of the same animal, without disclosing this) and includes a sample agent disclosure agreement and a veterinary dual agency agreement. TOBA provides Sales Integrity Program literature and materials to all of the major sales companies for distribution and display at their auctions. TOBA works to provide the education necessary for owners and breeders to make informed decisions at public auction. 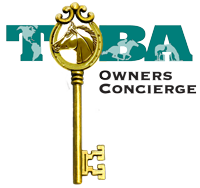 Each year, TOBA honors owners and breeders from 24 states and Canada (TOBA state network). Also honored five Finalist for National Owner of the Year, from those five TOBA names a National Owner of the Year, two National Breeders of the Year (small breeder/large breeder), Broodmare of the Year, Rood & Riddle Sport Horse of the Year, National HBPA Claiming Crown Horse of the Year, and the Robert N. Clay Award (recognizing a member of the Thoroughbred racing community who has made an outstanding contribution to preserving land for equine use). 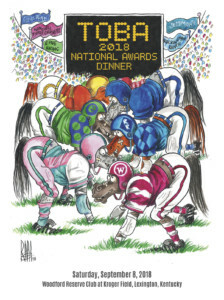 The 33rd annual National Awards Dinner was held on Saturday, September 8, 2018 at the Woodford Reserve Club at Kroger Field in Lexington, Ky.
South Carolina: Franklin G. Smith, Sr. Thank you to our 2018 Awards Dinner sponsors! Thank you to the following dinner program advertisers. We appreciate your support! The Claiming Crown is a partnership between the National Horsemen’s Benevolent and Protective Association and the Thoroughbred Owners and Breeders Association. The Claiming Crown was envisioned to be the claiming horse owner’s Breeders’ Cup; a special racing event, created for the sometime-forgotten “average owner,” and featuring some of the most competitive horses in the country. Every horse owner, regardless of the level at which their stable competes, has an equal chance to participate, as the Claiming Crown is open to all claiming horses irrespective of where they were foaled or race. The Claiming Crown, which consists of nine races worth $1.1 million in purses, has been held annually since 1999 and has become the highlight on the racing calendar for horses which have started for claiming tags between $7,500 and $35,000. TCA’s mission is to provide a better life for Thoroughbreds, both during and after their racing careers, by supporting qualified repurposing and retirement organizations and by helping the people who care for them. TCA grants funds to organizations in four categories including: Thoroughbred retirement, retraining and rehoming; research; backstretch and farm employee programs; and equine-assisted therapy programs. With the support of the Thoroughbred industry, TCA has distributed over $21 million in grants to more than 200 Thoroughbred-related non-profit organizations. TCA is a 501(c) (3) organization, governed by a Board of Directors. TCA is the charitable arm of TOBA. TCA’s largest annual fundraiser is a Stallion Season Auction held each January in Lexington, Kentucky. For more information please visit www.tca.org.